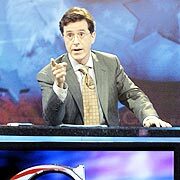 After just two weeks on the air, Comedy Central has extended The Colbert Report through 2006. The Daily Show spin-off has been drawing about 1.2 million total viewers each night and has kept most of The Daily Show's audience. That's a big improvement over last year's timeslot occupant, Tough Crowd with Colin Quinn. Tyra Banks wanted to know what it feels like to be fat. So she dressed up in a fatsuit to masqueraded as a 350 pound woman- and said she was shocked by how people reacted to her disgusting flabbiness. Get this- people were mean- and laughed at her! The segment will air Monday on "The Tyra Banks Show." The Real Mystery: Who Will Be Able To Find NBCU's New Network? NBC Universal is starting yet another cable channel. Called Sleuth, it will appeal to fans of mystery and crime shows. It launches January 1, relying heavily on movies and old reruns from the Universal library, including Miami Vice, The A-Team and Knight Rider. Missing from Sleuth's lineup: Law & Order and its spinoffs. They are locked into syndication on TNT and USA. Sleuth will initially be seen in about 5 million Time Warner Cable households. Aaron Brown, once one of CNN's most prominent anchors, is leaving the network. After the network and anchor discussed their collective future, they mutually decided to part ways. His prime-time slot goes to Anderson Cooper and an expanded two hour Anderson Cooper 360. CNN honcho Jonathan Klein said the move was to take advantage of their hottest personality. Meanwhile, Cooper's old 7 p.m. slot will be filled by an expandedThe Situation Room with Wolf Blitzer.